This is another clear blue autumn day with no rain in sight. Today the trees have begun to show more color maybe since the evenings have become cooler. 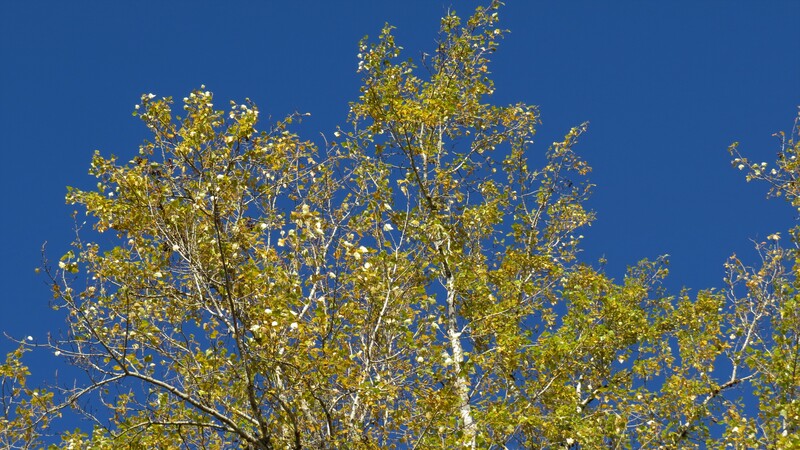 It is the Black Cottonwood, Populus trichocarpa, that really stands out as a vivid yellow candle against the blue, blue sky. 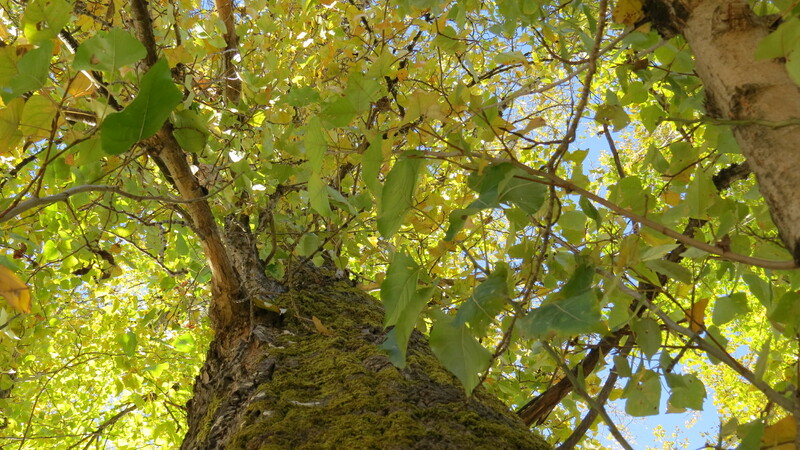 There is a breeze that moves across these trees and causes the Cottonwood leaves to flap wildly, making a loud rattling sound, like a hundred small castanets. I have learned that it is the shape of the leaf stems that makes the leaves flutter like this. 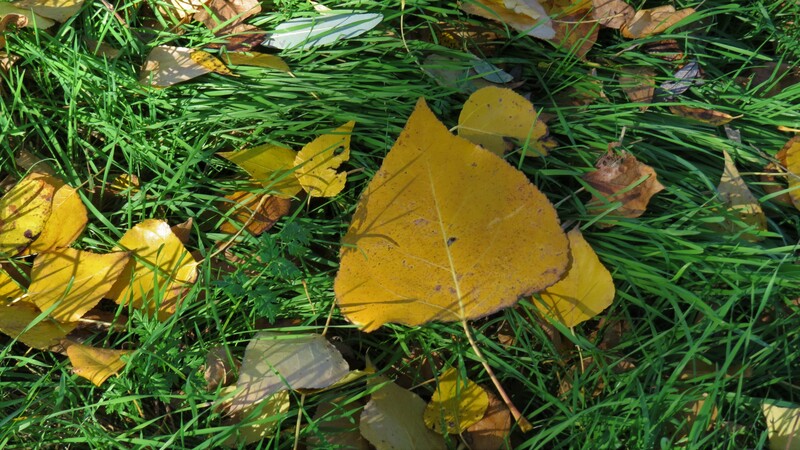 Just like in the Quaking Aspen trees, Populus tremuloides, the leaf stem is flattened on one side which makes it twist easier in the slightest wind. 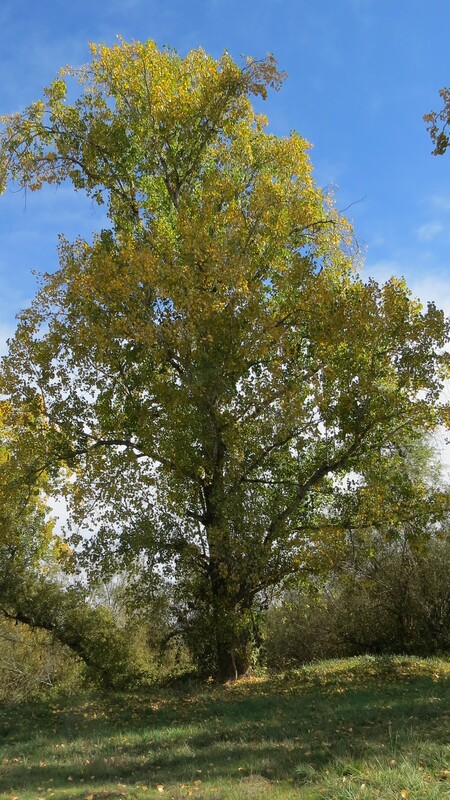 This Cottonwood tree seems to be over 80 feet tall and its base is larger around than my outstretched arms, it is one of the many large Black cottonwoods in our valley. These trees are, what is called, dioecious, which means that male and female flowers are borne on separate trees. The female trees are the ones that when they are done flowering, send hundreds of cottony white seeds into the air. This is why the name “cottonwood” is given to these trees. But the male trees do not have these cottony seeds. It appears that most of our trees in the valley are males. I recall being in Yellowstone National Park in Montana, the Grand Tetons in Wyoming, and the Sawtooth Mountains of Idaho in the fall and seeing the rivers there bathed in a golden yellow light from the riparian corridors full of these beautiful Black Cottonwoods. 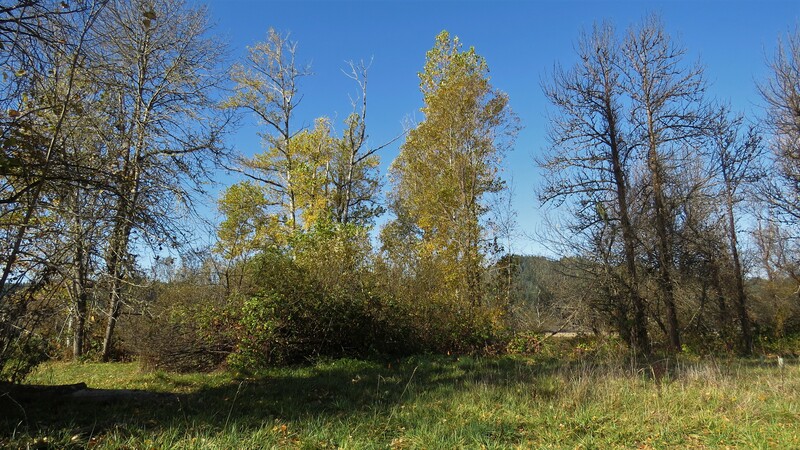 In our valley, along our much smaller creeks, there are not as many of these trees, yet their beauty and majesty fill the blue autumn sky. Some may live to be 400 years and grow 98 to 160 feet with a trunk diameter of over 6.6 feet. There is one in Salem, Oregon that holds the record at 155 tall and 8.8 feet in diameter. 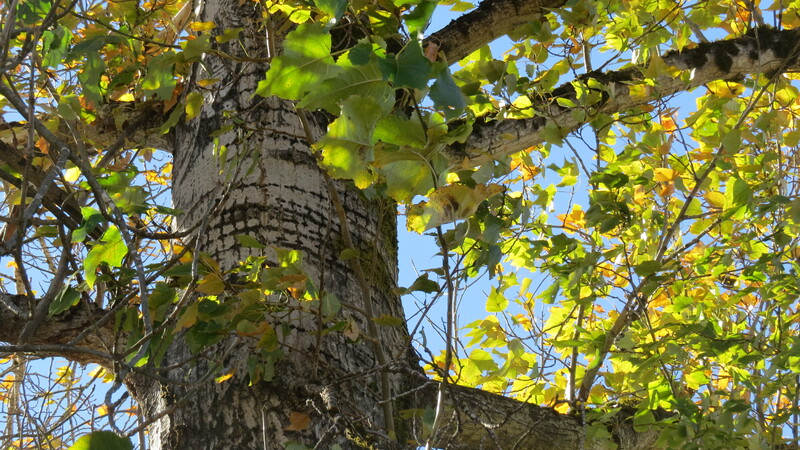 Black Cottonwood is used as lumber for house building, is made into plywood, and high-quality book and magazine paper. It can reach pulp production size in 10-15 years and for timber at 25 years. Commercial extracts are produced from the fragrant buds for use as a perfume in cosmetics. After learning this,( I took one of the buds and crushed it between my fingers and took a big whiff. it had a lovely, almost vanilla smell). Native Americans use this tree as medicine because of its salicin content used raw or in slaves to treat various ailments. The wood, bark, and roots are used for canoe making, rope, fish traps, baskets, and structures. The gum-like sap is used as a glue or as waterproofing.